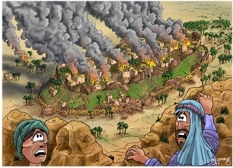 24 Then the Israelites burned the city and everything in it. Only the things made from silver, gold, bronze, or iron were kept for the treasury of the LORD’s house. 25 So Joshua spared Rahab the prostitute and her relatives who were with her in the house, because she had hidden the spies Joshua sent to Jericho. And she lives among the Israelites to this day. who tries to rebuild the city of Jericho. 27 So the LORD was with Joshua, and his name became famous throughout the land. This scene is set in the morning. In the foreground is a young man on the left & an older man on the right, hiding behind some rocks. There are some tiny black dashes in the extreme right & middle of the scene, amongst the trees. These are the Hebrew soldiers, leaving the city of Jericho to burn, taking the plunder back to their camp. I’ve been meaning to draw this, the last of this 6 scene set, for a long time. At last I’ve finished it! It has taken a long time to draw & colour this particular scene, because it has so many elements in it. The fire & smoke is quite complex & time consuming to draw & colour, not to mention all the trees, walls, houses, etc. I have included in the foreground two men hiding in the hills & looking with horror on the scene of Jericho’s destruction. Without them there is little “human interest” in the scene, & their expressions help the viewer to understand what is going on in the picture. I imagine these men to be shepherds, who’s flocks of sheep &/or goats might be roaming the hills, looking for grass to eat. Shepherds often spent quite a lot of their time out in the wilderness, tending their flocks in Biblical times. It is quite possible that people like these two men witnessed (from a distance) the destruction of Jericho. It should be noted that cities in Biblical times were probably much smaller than the sprawling metropolises of our day. A city today can easily house many millions of citizens, whereas a city of Biblical times might have housed a few thousand or tens of thousands of people & still been considered a city. Jericho was considered to be a major city of the region, but may well have only housed a few thousand people. That is why it looks quite small in my picture.